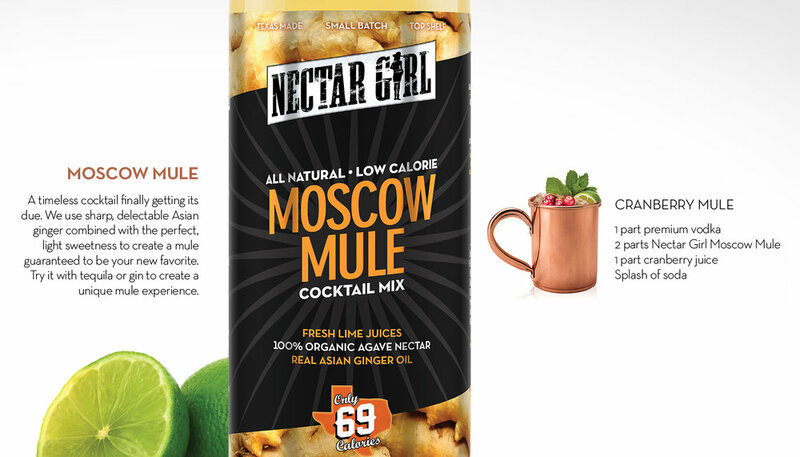 NECTAR GIRL IS THE ORIGINAL, TEXAS MADE, ALL NATURAL, LOW CALORIE, SUPER PREMIUM LINE OF COCKTAIL MIXERS. Tired of syrupy, high calorie cocktails served in restaurants, Nectar Girl started with one simple and direct goal: mixology in a bottle. A natural, pre-made mixer that shuns artificial additives and tastes fantastic. So after a year of mixing and developing, we created Nectar Girl. We’re 1OO% all natural, and we really mean it. Produced with organic agave nectar, fresh juices and real fruit oils, Nectar Girl is now the go-to mixer for those looking for an incredible tasting, top shelf, low-calorie cocktail. Consistent, delicious cocktails produced locally, and made for people to love.